Daniel Barenboim’s selection of piano sonatas from throughout Beethoven’s œuvre to form a series of varied programmes is not Jean-Bernard Pommier’s way. His Kings Place cycle, of which this recital was the first instalment, will be strictly chronological, although, like Barenboim’s, it will be limited to the thirty-two ‘canonical’ works. There is something to be said for either approach and little, it seems to me, to be gained by lamenting that the other one has not been chosen – although this did not prevent low-level carping from the odd sour critic determined to knock Barenboim from his pedestal. Pommier’s cycle is to be taken at a slower rate than Barenboim’s, a recital a month. I make this initial comparison not out of an obsessive regard for Barenboim, but because they will naturally be in many listeners’ minds, following the great ‘event’ of Barenboim’s cycle. And, of course, the venue is different: Kings Place, newly opened, rather than the Royal Festival Hall. I can say that the acoustic of the shoe-box-shaped Hall One, completely soundproof and lined with the wood of a single, five-hundred-year-old German oak, is excellent, if unsparing. There is nowhere for the musicians to hide, likewise for the audience, although this did mean that the sound of incessant fidgeting was magnified. Why were so many people shuffling, dropping, and picking up papers, or engaging in mysterious rubbing or goodness knows what? This is not a criticism of the hall in any sense but it is certainly a criticism of certain members of the audience. The first half of the programme, consisting of the first two Op.2 sonatas, was in many respects disappointing. In an introductory note, Pommier cautioned us: ‘The important thing to remember is that these works do not start off in a “minor” way.’ Very true, but that is not necessarily the impression gained here. The first reading of the F minor sonata received a classical, neo-Mozartian reading, perhaps inspired by the opening ‘Mannheim rocket’, but also, it seemed, by Mozart’s great C minor sonata, KV 457. Whereas Mozart is straining at the bounds of what his material allows, Beethoven here sounded a touch reticent, which is hardly a Beethovenian quality. The Adagio displayed a commendable control of line and clarity but lacked magic. Pommier caught nicely the metrical ambiguities of the Menuetto, though his reading lacked mystery; a dash more pedal would not have done any harm. On the other hand, the contours of the trio were clearly felt and communicated. The Prestissimo finale was over-pedalled, some of its furious triplet figuration obscured. I wondered whether Pommier was taking the movement too fast, or at least too fast for him; the music sometimes seemed to run away with him, slowing sounding motivated by technical rather than musical considerations. This was not a problem later on and the movement concluded with real fire, but it was all a little late. At the outset of the A major sonata, Pommier sounded more at home, attuned to the quirkiness of Beethoven’s writing. Yet his reading soon stiffened, lacking the flexibility that many players have brought to this work. The openings of the development and recapitulation brought a welcome sense of rejuvenation, although this was not altogether successfully sustained. Structure, however, was eminently clear. If the pianist brought a gruff nobility to the Largo appassionato, he was sometimes simply plain and charmless. Likewise, the line between pressing onwards and sheer relentlessness was crossed more than once. I liked the reappearance of a quirky mood in the scherzo; Pommier displayed a good rhythmic sense throughout. The rondo’s theme should sound melting, heart-rending even; here it sounded disconcertingly matter-of-fact. Beethoven marks it – unusually – grazioso. I found myself longing for a little mannerism, some sign of personality, even if it were imported from without. It was not to be. Pommier’s reading also lacked dynamic differentiation, although this became more pronounced as the movement progressed. Again, however, it was rather too late. I do not know what was put into Pommier’s half-time oranges but the third of the Op.2 sonatas sounded as if the music had been brought sharply into focus. There was real Beethovenian character here: humour and vehemence from the opening bars. The music-making was more differentiated, more yielding. I still often missed a greater lightness of touch in the first movement, but it was not entirely lacking. There was certainly a greater sense of mystery than had previously been communicated, not least in the great cadenza and the approach thereto. The Adagio flowed but was not too fast. Pommier displayed a fine sense of harmonic and rhythmic momentum, aided by far more sensitive dynamic contrasts than had been heard during the first half. Lines sang more freely; there was even the odd presentiment of Schubert. With the scherzo came a greater lightness of touch than we had heard hitherto; I even thought once or twice of Mendelssohn. The whole was built upon a clear rhythmic security, without stiffness. Such attributes also shone through in the closing Allegro assai, joined by a sense of fun, especially at the opening statement of the principal theme. Pommier could still be a little heavy-handed but this was much less of a problem than before. His trills were excellent. The Op.7 sonata marked something, I am afraid, of a retreat, though not entirely. The first movement started well, with a splendid sense of life. However, the syncopations at the end of the exposition – and their reiterations – could have told more, sounding rather limp. There was nevertheless considerable virtuosity on show here, virtuosity that never sounded as if it were being applied for its own sake. The slow movement was dignified but earthbound. I could not discern those great metaphysical vistas opening up, such as is the case in great performances of this work. The scherzo dragged at times, partly on account of a lack of lightness where required. However, the trio exhibited a winning Romantic vehemence, presaging Schubert and Schumann. It was very good; the rest of the movement was somewhat plain. Unfortunately, the magic that can sound from the very opening of the rondo – it certainly did in Barenboim’s performance – was simply not there. Forthrightness is all to the good, but it is far from the only quality the music demands. The C minor episode was splendidly dispatched but there was not nearly enough contrast when we needed repose. Too much of this movement sounded as though it wanted to be the opening of the Emperor concerto but could not. I shall pass over the frankly inappropriate encores. This was an excellent concert, constructed around Mark Padmore’s choice of Britten’s Nocturne as a work with which to inaugurate a new collaboration with the Britten Sinfonia. The connections between the works were genuine and interesting but never merely didactic. It seemed generous of Padmore to share the limelight with violist Maxim Rysanov, soloist in two of the works presented, but that generosity was repaid with fine performances indeed. Stravinsky’s brief fanfare – almost beating Webern at his own game – made for a splendid opening gambit. Two trumpeters, Paul Archibald and Tom Rainer, brought precision and tonal warmth, the echoes of the Toccata to Orfeo setting down a marker for John Woolrich’s Monteverdi explorations, as well as leading almost seamlessly into the world of Birtwistle’s Prologue. The baleful quality of Birtwistle’s writing was captured by Padmore and members of the Sinfonia, the reappearance of the trumpet underlining the connection between the two pieces. Padmore’s diction was not always beyond reproach but it was interesting to hear a somewhat Brittenesque tonal quality applied to Birtwistle; I thought it worked rather well. This led us to Britten himself: his final work, Lachrymae, in the version for viola and orchestra. Rysanov sported a strange, somewhat vampirish outfit. There could be no doubts, however, concerning his performance, nor as to his direction of the other players. The first bars were played vibrato-less, allowing the music then to blossom, as if bringing distant music from Dowland’s time more sharply into focus in our own. I liked the occasional hint of contrast between Rysanov’s ‘Russian’ string sound and the more ‘English’ quality of his colleagues. This was not overdone and was far from ever-present, but it put me in mind of Britten’s friendships with Rostropovich and Shostakovich. I liked even more the occasional hints of Berg, stronger as time went on, the appearance of Dowland’s music reminiscent of – though it could hardly be expected quite to match – the appearance of the Bach chorale in the Berg Violin Concerto. The young Britten, it may be recalled, had greatly desired to study with Berg in Vienna, a desire frustrated by the parochialism of his teachers at the Royal College of Music. Rysanov brought the music to considerable heights of passion, underpinned by a finely judged balance between rhythmic freedom and security. Britten’s musical transformations were lain bare, but never clinically so; there was a true sense of the cumulative power of musico-dramatic progression. Two arias from Samson followed. I was rather surprised, given Padmore’s lengthy association with ‘authenticke’ conductors, at the wideness of his vibrato here. Indeed, it seemed excessive and was toned down considerably upon the return to Britten. I also wondered whether less might have been more when it came to employment of the head voice. Diction was much better in the first aria, ‘Total eclipse’, Samson’s lament for his lost sight, though it was more variable in ‘Thus when the sun’. Padmore’s melismata here were perfectly handled: each note crystal clear, yet never at the expense of phrasing. I was much taken with the reassuringly old-fashioned sturdiness – though never heaviness – to the playing of the Britten Sinfonia. Handel, who nowadays suffers some truly appalling perversities in the name of ‘authenticity’, had his dignity restored at last. The second half opened with Woolrich’s Ulysses awakes, for me perhaps the highlight of the programme. The opening double-bass line led perfectly into Rysanov’s viola line, permitting Monteverdi’s music truly to blossom in its new surroundings. This was a passionately ‘inauthentic’ treatment, though it never succumbed to all-purpose Romanticism. Almost Purcellian in its melancholy, the reminder of the English Orpheus presented a bridge not only between Woolrich and Monteverdi but also between Woolrich, Britten, and Monteverdi. I could not help but think of Britten’s superlative recorded account of Purcell’s great Chacony in G minor. Harmonic horizons broadened yet Woolrich always remained faithful to the spirit of Monteverdi. A modernist halo was provided by the players of the Britten Sinfonia, a powerful reimagining – and here I thought of Henze’s realisation of Il ritorno d’Ulisse in patria – of Monteverdi’s continuo ensemble. I wondered whether one or two vocal phrase-endings were ever so slightly tossed away but, in the face of such a magnificent performance from Rysanov, this must be the most minor of criticisms. Far more to the point was the apt vocal flexibility to his reading, heightened by the faultless interplay between soloist – first among equals – and ensemble. This performance was, quite simply, outstanding. We came finally to Britten’s Nocturne. Once again, the ever-flexible Britten Sinfonia was on excellent form, both as an ensemble and as soloists. There were certainly many opportunities for soloists to shine, all of them well taken: bassoon, harp, horn, timpani, oboe, flute, clarinet, and strings. The interludes between songs were all extremely fine. Britten’s sound-world announced itself from the very first bar, the strings’ sense of uneasy undulation during the setting of Shelley’s Prometheus unbound unerringly caught. Padmore had mastered the trickiness of the Peter Pears-inspired vocal writing, accomplishing what Pears himself defined as the role of technique: the liberation of the imagination. There was a real sense of the magic and menace of Coleridge’s moonlight in The wanderings of Cain, not least thanks to the opening harp sounds and the gradual darkening of Padmore’s voice. Word-painting was attentive, for instance in the setting from Thomas Middleton’s Blurt, Master Constable. Here Padmore led us through the hopping of the cricket to the ‘peep, peep, peep, peep,’ of the goat, the latter with the able collaboration of Stephen Bell on French horn. Oboe and pizzicato strings made their mark in Owen’s The kind ghosts, followed by wonderfully flighty flute and clarinet in Keats’s Sleep and poetry. The scherzando quality those instruments imparted contrasted powerfully with the English stillness of the strings, Padmore not only connecting the two moods but leading and adapting to them. I thought, however, that his tone sounded bleached, even threadbare by the end of this movement: a pity, especially given the words: ‘... all the cheerful eyes that glance so brightly at the new sun-rise’. But there was compensation in the final Shakespeare sonnet (no.43) from the warm, ardent strings, and the sense of return at the end was impressively caught by all musicians. There are two great arias at the beginning of Monteverdi’s opera Il ritorno d’Ulisse in Patria: one for Penelope, and this one for Ulysses, waking on the shore of his homeland. In this retelling, the viola sings Ulysses. This was in many respects a fine concert. It had an intelligent programme, based upon the idea of ‘Sensations in Time’, presenting ‘four different views of time passing’. Four excellent composers, connected but with highly individual modernist voices, were featured. The Philharmonia Orchestra played under the baton of one of them, George Benjamin, himself the favourite pupil of another, Olivier Messiaen. Moreover, the performances were technically precise – no mean feat in such technically challenging repertoire – and displayed an impressively wide variety of orchestral colour. Xenakis’s Pithoprakta (‘actions though probabilities’) is written for forty-six strings, two trombones (used only once but with great impact), xylophone, and woodblock. The sound-world is startlingly original, although the Bartók of the Music for strings, percussion, and celesta actually sprang to my mind. One can imagine – and I did on this occasion – the glissandi in the score and performance as flickerings upon a radar screen or as figures of fractal geometry. There is also a sense of the natural world, intentionally or otherwise, of the swarming of bees. I even fancied that in the sweepings of the strings I heard a recollection of Messiaen’s beloved ondes martenot. Punctuating these sounds were the interventions from the regular sounding of the woodblock: implacable and somehow both disturbing and reassuring. The musicians of the Philharmonia could hardly be faulted in their execution of the score, directed by Benjamin with precision and understanding. And yet, I missed the last ounce – and perhaps the last few ounces – of aggression, of that raw power that complements Xenakis’s intellectual achievement. One may differ from Boulez’s fastidious judgement that Xenakis had a fantastic brain but absolutely no ear, but one wishes to hear the quality that led a fellow Messiaen pupil to speak thus. Ligeti’s Atmosphères received a splendid performance, wanting nothing in the mystery that is almost its trademark. There was an almost organ-like quality to the brass close to the beginning. Piccolos were properly piercing and the double-basses thundered as they should. Under the once-again swarming surface, the constantly moving and changing harmonic structures made their presence felt. Although Ligeti said that he had not known of Xenakis’s precedent, it was an excellent idea to perform this 1961 classic of note clusters and polyrhythms with Pithoprakta from five years earlier. In Chronochromie, Messiaen explores the relationship between sound and colour, making this a most apt work with which to conclude, if not quite to climax. There was much to commend in this performance. Messiaen’s voice was as unmistakeable from the outset as that of his birds. The tuned percussionists who provided such a riot of birdsong were truly outstanding. Benjamin imparted an unerring sense of harmonic direction and the distinction to which Messiaen himself referred, between implacable rigour (modes of duration) and freedom (birdsong) was readily apparent. I thought the violins a little lacking in vibrancy when playing en masse, but they truly came into their own in the exhilarating if fatiguing Epode: free counterpoint of eighteen independent (bird) voices, connecting with the Xenakis and Ligeti works. The coda came, as it should, as a relief, after such mania, disorder, or ‘freedom’, however one wishes to understand it. What, then, was the source of my nagging doubts? I do not think it was a matter of Messiaen fatigue at this stage in the anniversary year. (His piece, though the longest, was only one of four.) I think ultimately it lay in Benjamin’s direction and certainly not in the Philharmonia’s execution. Chronochromie in particular lacked the final sense of awe, that quality again of raw power, of Messiaen’s music being ‘about’ something other than itself. It was almost prettified. Perhaps the same could be said about Pithoprakta. I am all for new music – although none of this is actually so new anymore – being treated in classical fashion, just as classical music can profitably be treated as new. Yet the sense of trail-blazing discovery – and the music featured in this programme is surely as trail-blazing as music comes – was somewhat blunted. There was a commendable attention to detail throughout. Detail, however, should heighten the impact of the greater picture; this was not always the case here. An audition on returning home of Boulez’s superlative Cleveland recording of Chronochromie reassured me that precision and expression are far from antithetical in such repertoire. For all the nonsense that is spoken of Boulez’s alleged ‘objectivity’ – itself by now almost a meaningless word in such a context – that Messiaen pupil imparted a greater sense of the subject, of conflict, of drama. It cannot be claimed that Rimsky-Korsakov has had a good anniversary year. Messiaen certainly has, which is fair enough; it continues to be a remarkable opportunity to encounter or to re-encounter so many of his works. In England at least, it has perhaps been even more difficult to avoid Vaughan Williams, though some of us have tried our best. By contrast, one would barely have noticed that Rimsky died one hundred years ago. We need not slavishly follow anniversaries, of course, but when a figure is as neglected and frankly unfashionable as Rimsky, we might take a cue to investigate whether such neglect be deserved. Messiaen of course had his awe-inspiring legion of pupils, but Rimsky had Stravinsky and Prokofiev, amongst others. Full marks, then to the Kirov or Mariinsky – and to Sadler’s Wells – for presenting The Tale of Tsar Saltan or, to grant the work its full title, The Tale of Tsar Saltan, of his Son, the Renowned and Mighty Bogatyr, Prince Guidon Saltanovich, and of the Beautiful Swan-princess (Skazka o Tsare Saltane o sïne ego slavnom i moguchem bogatïre knyaze Gvidone Saltanoviche i o prekrasnoy Tsarevne Lebedi). It was Rimsky’s contribution to the 1899 centenary of Pushkin’s birth, first performed the following year. Sadler’s Wells, incidentally, would mount the British première in 1933. I do not wish to exaggerate. The Tale of Tsar Saltan is no unacknowledged masterpiece. It does not approach Tchaikovsky, let alone Mussorgsky; indeed, it is many respects what one would expect it to be. The standard of craftsmanship is high, both in terms of form and – unsurprisingly – orchestration. When one considers the sheer ineptitude of some works that continue to hold the operatic stage – Verdi in particular springs to mind – that is worth remarking upon. Nor does the work overstay its welcome: the four acts plus a prologue do what they need to do and that is that. Such self-control is rare and laudable. Yet there remains a certain emptiness at the heart – should there be one – of the work, such as one has equally come to expect from this composer. Some of the tunes are catchy; others are curiously unmemorable. Even the plentiful use of children’s songs and lullabies and fairground music – surely recalled by Stravinsky in Petrushka – seems to be simply a matter of ‘colour’. For all the jibes of the ‘Mighty Handful’ at Tchaikovsky’s supposed cosmopolitanism, his music exhibits far more Russian ‘soul’ than theirs, Mussorgsky as always excepted. Wagner sometimes seemed a little too obvious a model, mostly the Wagner of the Ring: the ‘Magic Fire Music’, the ‘Forest Murmurs’, and odd bits of processional or ceremonial music from Götterdämmerung. This was very much surface Wagner, though, for there was no motivic complexity to be found here. Perhaps the one real concession to modernity or at least instance thereof, although even this would seem more to be dictated by the tradition of storytelling in the Russian skazka, is furnished by the actors shedding their roles at the end to point out, if not quite a moral, then at least a happy ending: ‘Well, that’s the whole skazka; there’s no more to tell!’ Did Stravinsky have this as well as Don Giovanni in mind when composing the ‘moral’ to The Rake’s Progress? Yet Rimsky’s very limitations perhaps add something to Tsar Saltan’s viability as a fairy-tale. It is no more than that, despite the oft-encountered mistranslation of it as a ‘legend’ rather than a ‘tale’. The lack of realism and of any attempt to penetrate beneath the surface – not that one cannot do this, as we have known at least from the Romantics onwards – enables something enjoyably fantastical to emerge. Doubtless one could psychoanalyse – and fruitfully – but perhaps one does not actually need to do so. Certainly the production saw no such need. Apparently based upon Ivan Bilibin’s original sketches for the first performances, the designs were straightforwardly ‘colourful fairy-tale Russian’. Whilst there is plenty of room for other approaches, it is not necessarily a bad thing once in a while to have an opera set where it is ‘supposed’ to be – and there are real gains, such as the congruence between the visual and the musical. I did wonder whether more might nevertheless have been done in terms of digging a little deeper, perhaps presenting a more ‘modern’ slant lacking in the work itself, but for the most part I was content with what was given. The audience, however, seemed to find humour in what was not necessarily intended as such, ruining the all-too-celebrated ‘Flight of the Bumble Bee’ with laughter and even applause. At least it stopped two women in front of me from pursuing their clearly riveting conversation and from reading their text messages. Tugan Sokhiev generally seemed at home with the idiom. There were occasions when the music sounded a little too four-square, but for the most part he provided a sure hand on the tiller and conjured up a fine palette of colours from the predictably, yet nevertheless laudably, fine Mariinsky orchestra. The brass sounded splendid when given their head, not least when this coincided with a riot of percussion. At one point, the Rimskyfied coronation scene from Boris Godunov did not sound far away at all. Woodwind solos were especially well taken and there could be no complaint regarding the warmth and brightness of the strings. Rimsky as storyteller in the colourful entr’actes could hardly have wished for more help in shining through. Moreover, this was a good ‘company’ performance in terms of the singing. There was no one special ‘star’ to the performance, but that is not really the point here. Instead, we could once again marvel at the ability of the Mariinsky to cast from depth. Perhaps most affecting was Ekaterina Solovieva’s beautiful Militrisa, utterly credible as the honest girl who becomes Tsaritsa, the almost archetypal target of her sisters’ envy. Alexey Tannovitsky made a fine Tsar, assuming a gravity that belied his years. Sergey Semishkur nailed the role of the youthful Tsarevich, displaying just the right degree of ardent naïveté. I am not sure that there is much more for the Swan-princess to do than to sound – and to look – beautiful, but Olga Trifonova did that well. Natalia Evstafieva and Tatiana Kravtsova did well enough as Militrisa’s sisters, although their thunder was somewhat stolen by the malevolence of Nadezhka Vasilieva’s Babarikha. Eduard Tsanga showed that he could act as well as sing in the role of the Jester, whilst Vassily Gorshkov pretty much stole the show as Old Grandpa: character-acting at its best, with no sacrifice to vocal quality. So there you have it: an enjoyable and highly musical account of an opera neither trivial nor profound, but worth hearing every now and then. Things aren't what they used to be at the Hungarian State Opera – at least, so I am told, given that this was my first visit. What had remained a bastion of 'traditional' opera production has now felt the sweep of a new broom from its ambitious new leadership, more internationally inclined, headed by Ádám Fischer and Balázs Kovalik. Certainly no one could accuse this Fidelio of hidebound traditionalism. Sadly, what we had instead was an ill-thought through mishmash, which piled layer of symbolism upon layer of symbolism, with apparently little regard for coherence or even comprehensibility. Yes, the work is concerned with sacrifice, but that does not necessarily mean that it is a good idea to portray the Passion of Christ in confusing tandem with the narrative. (It is also in questionable taste at best to present a Christ with tacky electronic 'bleeding heart' at one point.) Nor is at at all clear how this tallies with presenting what would seem to be Leonore's dream, by having her stand at the bottom level of the stage, in vaguely 'operatic' garb, whilst having a male 'Fidelio' act out her moves on another - until, of course, she reveals her true self, although even then she remains down below. And the garish colour-coding did not seem to mean anything in particular, although it was preferable to the multicoloured 'celebration' of the final scene, in which we seemed for no particular reason to have entered the world of Flower Power. Embarrassed and embarrassing clapping from the chorus disrupted the music then too. And what was the point of the strange Angela Merkel look-alike, who strolled along the stage at the end? Kovalik and his team needed to go back to the drawing board. Musically, the story was more mixed. The orchestra played superbly throughout, its strings glowing with warmth and the woodwind especially characterful. The horns, bar the very odd cracked note - an almost unavoidable hazard - were beautiful indeed, crucial in this work. I thought the all-important off-stage trumpet a little too distant, but never mind. Ádám Fischer's reading did not quite seem to have settled down. There were some good things in it, although it never really acheived the symphonic stature that characterises great performances of Fidelio. On occasion, there was a distinct Italianate tintá; the music might have been by Rossini. This, however, merely stood out rather than giving the impression of a particular idea. Some might have found such an idea refreshing; I suspect that I should still have thought it quite inappropriate. There were also some odd decisions regarding the version of the work used. This was not straight 1814, since the 1805 ordering of the opening was employed. I am not sure that anything is really gained by this; tonal development tends rather strongly to suggest that the later ordering is better. Far more questionable was the reversion to the ‘tradition’ of performing the Leonore III overture prior to the final scene. I am quite aware of the distinguished pedigree for such a practice, yet here as ever the music overpowered what came after - not least given the deflating tendencies of the production. What could work under Furtwängler and doubtless under Mahler simply did not here, although the performance considered on its own terms was good, if somewhat removed from the outstanding performance the audience thought it had heard. Could there be a worse point at which to applaud?! The situation was rendered far worse by Fischer having the orchestra stand twice (!) to acknowledge the applause. Tünde Szabóki was not a great Leonore; nor was she a particular disappointment. She sang for the most part musically but without truly making her mark upon the role as many great artists have done. The competition is terrifyingly fierce, of course, but such is life. Thomas Moser was adequate, though little more than that, as Florestan. (I have heard worse but then one nearly always has in such roles.) Smaller roles were once again generally adequately taken, with three exceptions. Zita Váradi was simply terrible as Marzelline, her tuning all over the place. 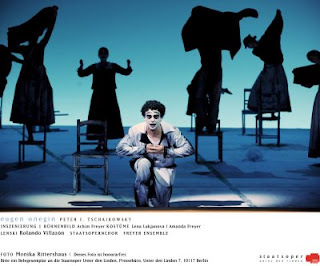 Friedemann Kunde could act as Rocco but no longer appeared to possess a voice, as was painfully evident in his duet with Béla Perencz's lightweight yet musical Pizarro. It was a relief, then, to hear in Gábor Bretz a Fernando as handsome of voice as of face; nevertheless, a Fernando can hardly a Fidelio make. The name of C.P.E. Bach occurred to me more than once during Marc-André Hamelin’s performance of Haydn’s marvellous B minor sonata. I subsequently discovered a guarded comparison between Emanuel Bach and Haydn in Misha Donat’s programme notes, so it seems that he, the pianist, and even your humble reviewer were thinking along similar lines – in my case, it must be said, as a result of Hamelin’s performance. Hamelin presented the sonata with some of the exaggerations that characterise the boundary between the Baroque and the Classical. The dynamic contrasts and use of the sustaining pedal were unashamedly Romantic but there were also numerous instances of late Baroque mannerism, not least in terms of the crushed ornamentation. It was rather as if Glenn Gould were being crossed with Mikhail Pletnev or even, given the sometimes chocolate-like tone, with Evgeny Kissin. I wondered whether the agogic exaggeration in statements of the first movement’s first subject would become merely irritating but it did not; instead, it heightened the sense of characterisation. This movement was taken quite fast for an Allegro moderato yet the tempo worked. Hamelin took the second repeat, adding to the distancing from the Classical period proper. The following major-mode minuet sounded duly Classical, almost Mozartian, yet also perhaps just the slightest touch empty, as if Hamelin were eager to return to the Sturm und Drang of B minor, which he did in the vehement trio. I wondered whether the Presto finale was a shade too fast, but Haydn’s marking is after all presto. Hamelin took it as a moto perpetuo, which swept all before it – all, that is, save for the slightly heavy-handed repeated notes at the outset, a problem that soon righted itself. His octaves were an object lesson in style and projection. We remained in B minor for Chopin’s third piano sonata. I was not sure that Hamelin quite had the measure of this work as a whole, although his performance certainly boasted splendid aspects. It was almost as if the music were too easy (!) for such a super-virtuoso. In the first movement, we were treated to a melting second subject, on its first and subsequent appearances, but its predecessor was just a little straightforward. That said, there was a fine sense of musical transformation when it came to the recapitulation. Needless to say, any technical challenges were readily surmounted. The scherzo was a definite instance in which the music sounded a little too ‘easy’ for the pianist. There was a sense of him gliding over its musical substance. The trio appeared to benefit through its lack of virtuosity. Hamelin presented a ruminative yet nevertheless developmental Largo, with a fine sense of the barcarolle later on, although some of the earlier material sounded a touch matter of fact. The finale was impressively virtuosic, which is not to say emptily so, although, like sections of the third movement, it sometimes veered dangerously close to Rachmaninov. I wondered whether Hamelin would have been happier more at home performing Alkan. Debussy seemed to speak more readily to this pianist, as we heard in the second book of Préludes. The veiled quality of Brouillards sounded spot on, followed by exquisite voicing in Feuilles mortes – that in a piece one would not necessarily have thought most lent itself to such ‘Romantic’ treatment. Its music was certainly heard ‘without hammers’ – likewise in Canape – and with fine use of the sustaining pedal. La puerta del vino suffered from a heavy-handed opening – repeated upon re-visitation of the opening material – but the piece was characterised more generally by a fine sense of insistent rhythm and exotic danger. La terrasse des audiences du clair de lune benefited from a nicely mysterious opening, the mood continuing throughout Hamelin’s performance. There was an interesting hint of an almost Brahmsian waltz rhythm at times. Not every prelude was equally successful. Bruyères, for instance, was well executed but a little plain. ‘General Lavine’ – excentric captured the eccentric aspect well but primary colours were a little too much to the fore elsewhere. Les Tierces alternées sounded a little too close to the parodic style Debussy had employed in Doctor Gradus ad Parnassum; again, I wondered if its technical challenges were not great enough. But in the final Feux d’artifice, post-Lisztian pyrotechnics were undoubtedly appropriate; Hamelin’s glissando was simply jaw-dropping. Despite certain reservations, then, this was in many respects an estimable account. I suspect that the audience would have been treated to an encore or two but this must remain mere suspicion on my part since, unfortunately, I had to leave immediately. Where to begin? The production or the musical performance? They could hardly have been more different. I shall start with the musical performance, since it is far more cheering to do so. Rarely can Eugene Onegin have been conducted better than it was here under Daniel Barenboim. He conceived the work in one span, yet with impeccable attention to the needs of the moment. There was a flexibility in his account that harked back to Furtwängler – although I am not sure that Furtwängler ever conducted Onegin – with tempo variations often pronounced yet never abrupt. Prince Gremin’s aria, for instance, was taken at a daringly slow tempo but with such masterly control that it worked, and the mood swings of Tatyana’s Letter Scene registered both with almost psychoanalytical clarity and with heartfelt emotion. Rhythmic security was not sacrificed but enhanced by this. (Instructive is the contrast with the inhibited stiffness that sometimes characterised a far from inconsiderable Covent Garden performance under Jiří Bělohlávek earlier this year.) The Staatskapelle Berlin followed his every move, displaying an utterly gorgeous, truly burnished tone. I should chance my arm and say that Onegin can never have been played better than it was by this orchestra. A wonderful old-world depth of tone throughout the string section and magical woodwind were complemented by a brass section by turns soothing and assertive, according to the demands of the score. The way in which solo horn and harp registered during the Letter Scene was not only ravishingly beautiful but also indicative of the Romantic possession with which Tatyana was seized. Anna Samuil of course contributed to the success of this scene. Hers was not a portrayal with quite the star quality of some of the great singers of the past – perhaps this will be come – but it was intensely musical and often rather more than that. The Letter Scene and her final confrontation with Onegin were the highpoints of her performance. I thought less of Maria Gortevskaya’s Olga; there was nothing especially wrong with her performance but it remained somewhat anonymous. The production did not help, to put it mildly, but there were some singers who miraculously managed to rise above it. Likewise the stiffness that characterised some of Roman Trekel’s assumption of the title role cannot simply be ascribed to Achim Freyer, sorely tempted though one might be. The notes were sung – and sung musically – but there was little charisma here. Gerald Finley had shown how it should be done at Covent Garden; by contrast, Trekel, a fine Doktor Faust here in Berlin last year, seemed miscast. The undoubted star was Rolando Villazón as Lensky. It is a wonderful role but Villazón surpassed any reasonable expectations. He proved as ardent and as attentive to the text – both verbal and musical – as the splendid Piotr Beczala had done in London. Perhaps still more admirable was the way Villazón managed to transform a lifeless production to his advantage, investing his every move with great moment, however misconceived the general premised may have been. I mean it as a compliment when I say that, should, God forbid, Villazón ever lose his voice, he could doubtless pursue a second career as a clown or even a mime artist. Gremins, like King Markes, rarely disappoint. That Christoph Fischesser was no exception does not lessen the achievement of his rich-toned bass aria. Margarita Nekrasova made a wonderful, Babushka-like nurse. Stephan Rügamer and Viktor Rud both shone in their smaller roles. Whilst there was the odd occasion when the chorus was not quite together with the orchestra – and I am not at all sure that this was not Barenboim’s fault – the singing of the Staatsopenchor Berlin was of the high standard we have come to expect. Diction was excellent, as indeed it was with the entire cast. Then, however, there is the small matter of the production. I cannot – may the Almighty be thanked – imagine how a production of Eugene Onegin could be more wilfully perverse than that presented by Achim Freyer. 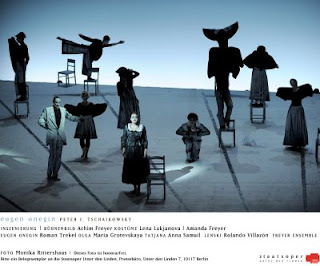 It was certainly not so atrociously inept as, for instance, Katharina Wagner’s Bayreuth Meistersinger, which, the angel voice of Klaus Florian Vogt notwithstanding, will surely prove to be the theatrical nadir of my operatic year: an unanswerable refutation of the hereditary principle. In terms of a director who knew what he was doing and was able to accomplish it, Freyer’s misconception may rank with that of Peter Sellars’s Zaide, although, clutching at straws somewhat, Freyer’s production was certainly more tightly disciplined. There could be no doubt that singers and actors alike were doing precisely what Freyer desired; the precision of their movements was highly creditable were one to consider it as a thing-in-itself. What this production lacked in terms of the inept, it handsomely made up for with the inapt. Throughout we had a scene of alienated, disengaged circus performers, unable to relate to each other, indeed in no real sense of the word characters at all. That was it: no development, no story even, certainly no connection with the words, let alone with Tchaikovsky’s music. Freyer’s point is clear enough, that the ‘characters’ are mere stereotypes – which they are certainly not, should one bother to engage with the work – and that the love about which they sing is illusory, non-existent. Everything goes round in circles; no one can do anything about it. I do not exclude the possibility that such a point might be made in a production but this was the only point, hammered home with an insensitive insistency that might make a sledgehammer appear to be a tool of woolly-minded consensus. The fact is that one could do precisely the same thing to any work of one’s choice; without even the slightest attempt to connect Konzept and work, let alone to permit the former to grow out of the latter, it is difficult to see how this was a production of Eugene Onegin at all. It was a relief to have chairs appear suspended in mid-air, simply in order to see something different. I could not even say that of the sudden appearance of red ping-pong balls, which merely irritated. Other than that, there was almost no relief from the monochrome all-purpose set and the pointless moving around from the Freyer Ensemble – which seems to appears in all of Freyer’s productions, whether called for or not – and from the other, incredibly patient performers. Yes, we got the point a few hours earlier. For some reason, Lensky appeared to be the focal point, which might well have been the nub of an interesting production, but this was once again merely insisted upon rather than developed, let alone explained. Had he been permitted to become a flesh-and-blood character, then it might well have worked. The contrast with the musical performance could not have been greater. Yet, despite Freyer’s relationship to Brecht, this did not qualify as Brechtian Verfremdungseffekt. It was not even just a betrayal of the work; it was plain boring.